We like our sombrero, it's been the best Christmas tree stand I have ever owned, but that's not saying much. I like the two lips in it that hold a little water before it flows over the edge and down the slope. How much water does our sombrero hold? I haven't measured that. It has always been enough to hold my overflows. I'm all ears if someone has a better Christmas tree stand. 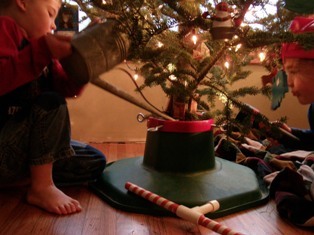 Particularly one that doesn't require me shimming the tree to stay upright. The wood floor underneath it has been sanded too many times. It's oak. Red Oak, I believe. 1 1/2" wide boards. Our floor guy told us it can't be sanded again. Overflowing the Christmas tree stand would probably mean replacing the floor. As you can see, we have small children which always introduces an element of danger. And there's a floor vent right under our tree that leads to my office. One other thing I don't like about our sombrero is that I have to use a long necked watering can and some years I need a flashlight. Join in and write your own page! It's easy to do. How? 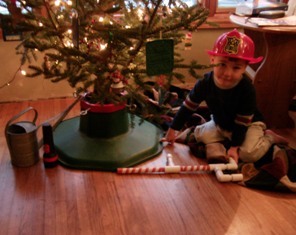 Simply click here to return to Christmas Tree Stand.